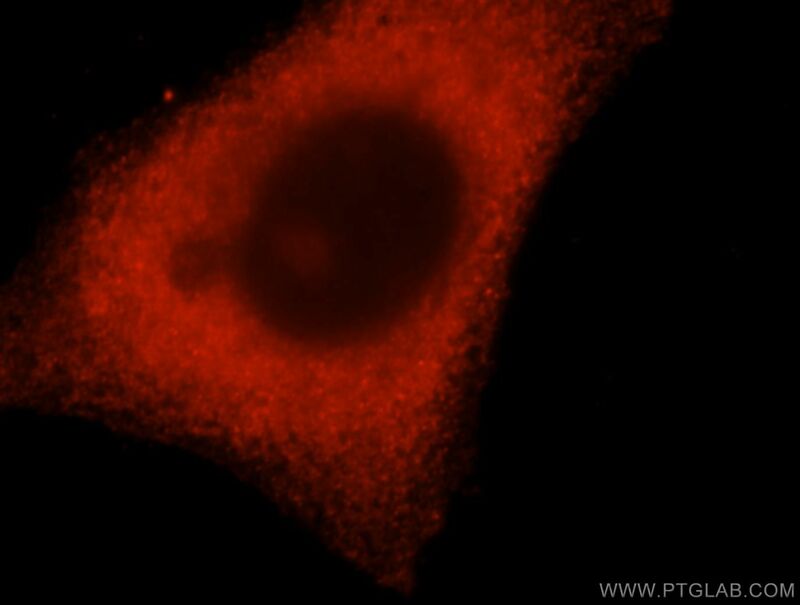 Immunofluorescent analysis of HepG2 cells, using DCTD antibody 16784-1-AP at 1:25 dilution and Rhodamine-labeled goat anti-rabbit IgG (red). DCTD(Deoxycytidylate deaminase) is also named as dCMP deaminase and belongs to the cytidine and deoxycytidylate deaminase family. It catalyzes the deamination of dCMP to dUMP, thus providing the nucleotide substrate for thymidylate synthase. Control of deaminase activity at this juncture in deoxyribonucleotide metabolism is determined by the ratio of dCTP to dTTP in the cell, since the enzyme is allosterically activated by dCTP and inhibited by dTTP(PMID:7685356). It has 2 isoforms produced by alternative splicing and can exsit as a dimer(pMID:8798492).